Despite my love for the Myers-Briggs personality test, it took me years to determine my own personality type. What was holding me back? I (unintentionally) persisted in putting down the answers I wanted to be true, not the ones that actually described me. There was a difference. Knowing yourself is not as simple as it sounds. Determined to get a better “fix” next time, I returned to my style profile to see if it needed any tweaking. And that’s when I discovered my problem: I’d filled out the style profile according to what I wished was true about me–not according to what was actually true. But last Friday, I got Fix #4–and it was perfect. I kept all 5 things. So what did I change to get such a great fix? I’ll tell you. Then I turned my attention to my style profile, and I immediately realized why they’d sent me blouses I hated: I’d asked for them. My profile was all over the place. For example, I’d specifically said that I loved and wore “bohemian chic,” but that’s an aspirational answer, not a realistic one. When Stitch Fix sent me bohemian pieces, I tried them–and hated them. With that new information about my personal style, I confidently edited my style profile to focus on classic and casual chic pieces–with a hefty dose of prep. From my updated style profile, after major tweaking. Now it says about classic and casual chic: “This style is me to a tee.” Not sure what “bohemian chic” or “edgy” means? 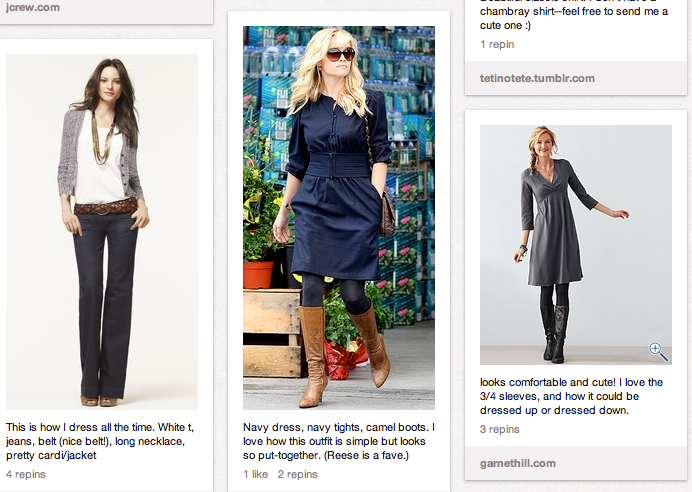 Stitch Fix has a Pinterest board for each style. Determining your personal style is a process. As with all self-knowledge, knowing what works for you and what doesn’t requires a good bit of time, thought, and experimentation. So embrace the process! Try new things: knowing what you hate is almost as valuable as knowing what you love. Be honest with yourself, and above all–have fun with it. Want to test-drive Stitch Fix? Here’s what to do. 3. Schedule your fix. Stitch Fix isn’t a subscription service; you schedule a fix whenever you’re ready. 4. Come back and tell me what you think! I’d love to hear all about your experience. My Go-To Shopping Strategy (And How It’s Backfiring on Me at the Moment): If you hate to shop, this post is for you. Don’t skip the comments section on this one! A Shopping Strategy for Women Who Hate to Shop: All about my first experience with Stitch Fix, including detailed information on the styling cards and style profile, and pictures of what they sent. First Impressions: Stitch Fix, Round 2. I show you what’s in my second Stitch Fix box, and tell you how my first impressions about it were completely wrong. Dressing for the Ordinary Days. Why I care about what I wear. Do you have a good handle on your own personal style? Please share some tips on how you figured it out (or tell us what’s holding you back). This post contains my affiliate links. Thanks for supporting Modern Mrs Darcy! 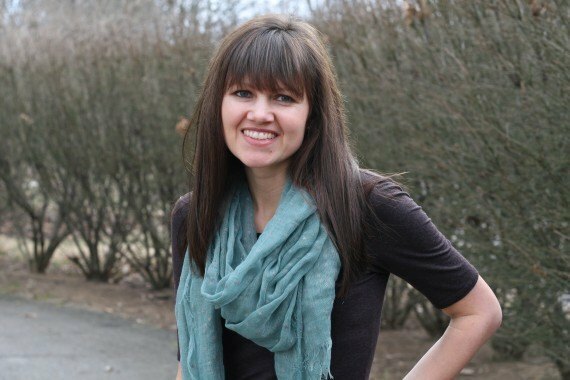 Just did my first stitch fix last week – thanks for this post. I’ve gone in and looked at my profile to make sure it’s not too aspirational. I love this service! I would love to do this, but I don’t have much spending money for new clothes…nor do I really “need” any. How much does this cost? As to cost, you select the price point you’d like in your style profile for each category–how much you’d like to spend for accessories, tops, dresses, etc. I think I have the lowest price point selected for each one (under $50, but my accessories have run $25-$34). I might have $50-$100 selected for dresses right now. You could also emphasize how much you do or don’t want to spend in the special request section when you request a fix. The styling fee for a box is $20, and it counts as credit towards whatever you keep (but it’s not refundable if you don’t keep anything). For better or worse, that makes it really easy to keep something from each shipment. So far, I’ve received blouses that cost $38-$78, dresses from $48-$98, accessories from $25-$34, and a coat that was over $100. I got my first Stitch Fix last week! It was a fun experience of opening up a box full of surprise items. I loved everything at first glance, but as soon as I tried on each item, my experience quickly went from “Woohoo!” to “Womp womp.” I ended up keeping one item mostly because I didn’t want to lose my $20 credit. It helped that it was the cheapest item, but I probably wouldn’t have bought it after trying it on in a store. As soon as I completed my feedback on the box, I went over to my profile to see what I originally answered. I had put “loose” for my preference for tops, and apparently, that means “hide your figure.” The tops they sent me turned my hourglass curves into a rectangle! Hopefully, the tweaks that I made will better work for my next Fix. Thanks so much for introducing me to this service though. I seriously love the experience. It’s so nice to have the clothes come to ME! Haha. I wholeheartedly agree: I love having the clothes come to ME! So I got my first Fix last week. It was fine. I kept one shirt. The rest were a little off. I gave very detailed feedback, and hope that the next one is better. It is definitely fun to get and open that box! And it’s hard not to be a little disappointed when you realize they’ve sent you a beige, see-through blouse. What box did I check that sent THAT to me?!? How do you tell your stylist you have a Pinerest board? Do you really have the same stylist every time? Hey Erin! Yes, you can link to a specific Pinterest board. In fact, they recommend that you create a board specifically for Stitch Fix and link to it in your profile under the “social networks” section at the bottom. I’m emailing you a screenshot so you can see. I just checked my records–I’ve had two different stylists do my four fixes. great advice. i’m constantly changing my style profile! On taking the MB, it used to be given to every new judge at the annual judges college. The administrator told us not to think about the questions too hard and just breeze through it. That advice – essentially to give in to my inherent laziness! – kept me from trying to figure out the right answer. 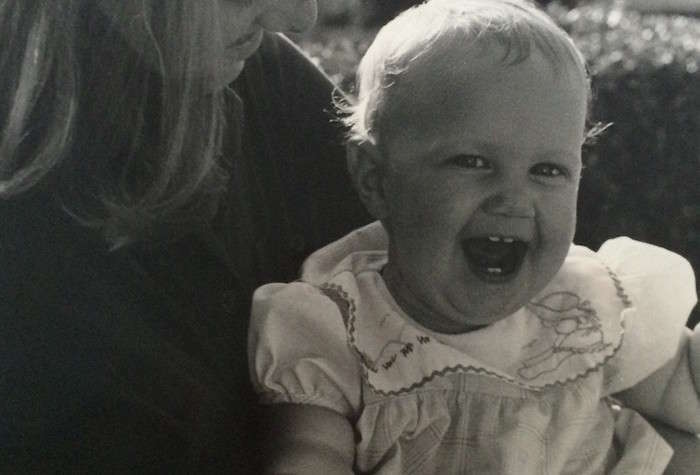 I wonder if my results would be any different now almost 18 years later? Do you know if they can accomodate maternity? I was all signed up and excited for it, and then got a surprise! Oh my goodness! This service is brand new to me. I can’t wait to go investigate. 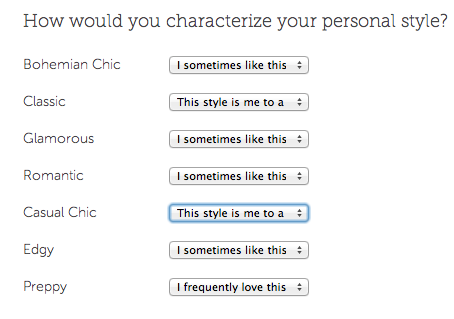 So interesting that you’d filled your style profile out aspirationally. I love the idea of making a Pin board just for your stylist. I’m going to start doing that. I liked a lot of what was in my second box but decided to only keep one item because of functionality. I know my style well but I may need to double check my settings, even though I specified my current needs. Also, like Blair said, you’re killing me here. The MBTI geek in me loves the idea of perusing other people’s style profiles! I do not have a handle on my personal style at all! 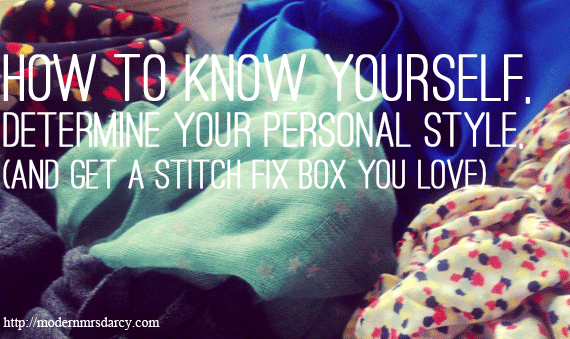 I’d love to do Stitch Fix sometime in the future, it seems like a great idea and a lot of fun! My personal style has had many faces over the years, often because I aspire to something that looks really great on other people, but when I try it, it just doesn’t FEEL right to me. Both physically and mentally/emotionally. It recently occurred to me that there is a particular style that I always tend to revert to and it always feels GREAT when I’m being true to it. I’m not sure how to articulate it, but I’d say it’s somewhat “casual chic” in Stitch Fix terms, heavy on skinny jeans, cardigans, and LOTS of black with other neutral colors such as grey, white, and beige thrown in here and there. Shana, that’s awesome that you have a style that you feel GREAT in! Gah! These Stitch Fix posts nearly drive me crazy with envy. I live in Canada, so I can’t do it. I was wondering, however, if you can specify certain types brands and things like that? I only purchase clothing made in Canada/USA/some of Europe or certified as fair trade to prevent any support of forced or child labour. Would a person be able to make a request such as that? Maybe one day they’ll open up to Canada. Me too, Grace. That’s exactly what I was wondering. We made a New Year resolution to buy only certified Fair Trade or made in USA/Canada clothing OR to buy second hand. Stitch Fix sources from many small manufacturers and this request strikes me as totally doable. I’ve received great answers to my specific questions from Stitch Fix when I email them at hello@stitchfix.com. Thanks for the advice, Anne! 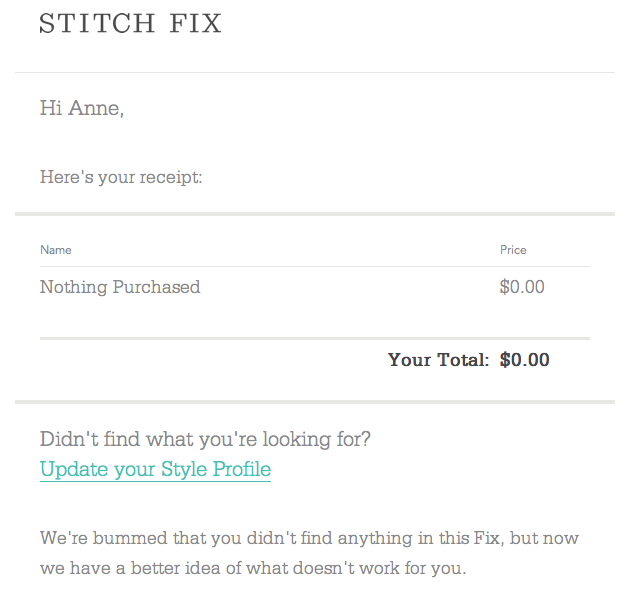 I love the concept of Stitch Fix and got my first “fix” earlier this month…with much disappointment! 🙁 The only thing I kept was a pair of earrings! But after reading your post, you’ve got me thinking…maybe I did the same thing you did. I remember stating that I really liked some styles that in reality I *never* wear! 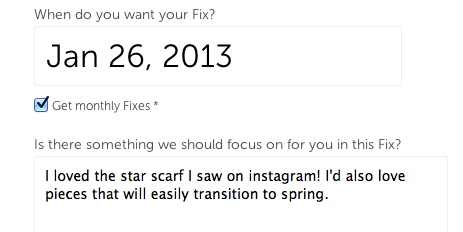 So…I’ll see how Stitch Fix #2 goes but if I’m disappointed yet again, I’m going to re-visit my profile. And love the idea of making a Pinterest board for them too! Whoa! This is awesome! I like shopping in the suburbs but I live in NYC and I’m a highly sensitive type. The lights, noise and crowds exhaust me so I almost never shop. This seems like a really fun solution. Also, Anne, you look really pretty in those pictures! Anne- congrats on finding a Fix that worked! As you know, I kept all 5 of my first fix. Indeed, I’m wearing a shirt from the Fix right now. I got in touch with the company to write about them for an article, and learned that the average customer returns about 3 items in each Fix. No one ever keeps 4 items (there’s no point with the 25% discount for keeping all 5!) They’re trying to stay ahead of the dressing room ratio. The average woman will take like 10 items into a dressing room and be thrilled if she gets 1. So as long as the average customer keeps more than that, it’s all good. I asked for mostly pants and skirts in my next fix, which I know will be tougher to get right. Fascinating! Thanks for sharing. Of course no one ever keeps 4 items (it would have cost me more to keep the 4 I wanted than keep all 5!) but I wasn’t sure what was “average.” And I had no idea what the average shopper’s dressing room ratio was. I asked for skirts in my next fix, so I’m keeping my fingers crossed! Love everything you got…you look great! Sounds like such a fun service. I tried Stitch Fix after reading about it on your blog and I was so disappointed with my first two boxes I had given up. Then I read this post and decided to give them one more shot. My third fix arrived last night and I loved it! Thank you so much for this post! Ellie, I’m so glad the third time was the charm for you 🙂 Thanks for letting me know! I really hate shopping and getting dressed everyday (because I hate shopping and have boring clothes). After seeing your post about Stitch Fix, I signed up right away and received my first box today. I love all of the clothes except for the dress they sent. I will wear the dress (would be silly to send it back since it’s free with the discount) but I will just have to find a belt or a jacket to go with it. Except for the jeans (which are so comfy and soft), I would have never picked any of the other items out in a store. I also love the cards they send with the item dressed up or dressed down. OK, I’m FINALLY going to check this out! I’m like you; there’s the style I THINK I am vs. what I actually wear – which is usually what I can afford. 😉 I think I might see if I could make this an early birthday present to myself. It seems so fun and worthwhile! It’s so hard to find time to really shop these days so this sounds wonderful. I love your hair, btw. I wish I could pull off those bangs, but they seem so high-maintenance to me. How often do you have to trim? Thank you! And hmmm. There’s a big difference between how often I should trim and how often I do. I probably do every four weeks or so, but if things get desperate I do teeny tiny baby snips off the bottom myself. My stylist doesn’t charge for between-appt bang trims. It’s just a matter of getting myself to her place! 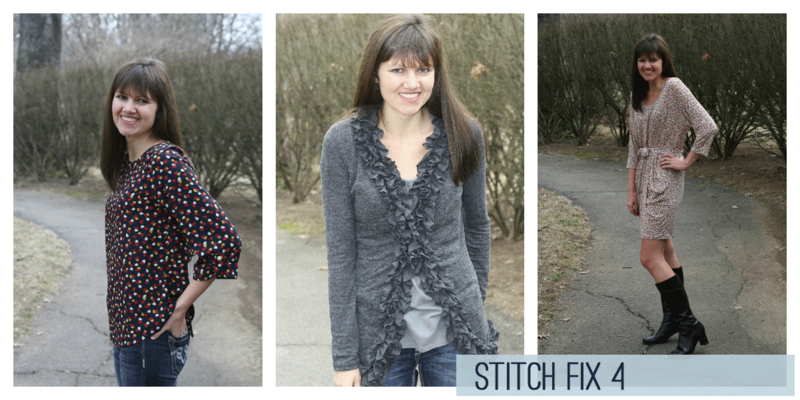 Pingback: My first Stitch Fix… whaddya think? I don’t do Stitch Fix, but I recently went through my overstuffed wardrobe asking myself if things sparked joy (cause I just read you-know-who as my “Book you can read in a day.”) Next to nothing kicked up any feelings of glee when I held it up and I couldn’t figure out why until I read this post. I’ve been buying far too much based on my aspirational wardrobe, picking up little cheap things that I wished I liked all over the place. I think I was afraid to spend real money on them, knowing somewhere inside that they were more of an experiment than my “true style”. Turns out this in fact detracts from my joy rather than sparking it. Thank you for giving words to how I was feeling! A Marie Kondo aside: while I found the book helpful, I feel much more compelled to actually change my over consumption habits by reading it in tandem with Jen Hatmaker’s book 7: An Experimental Mutiny Against Excess. I’d like to sign up for Stitch Fix but would like to make a Pinterest board first. Do I need to post items from Stitch Fix only? Also do you have a link I can click on so you can get credit when I sign up? Thanks! Nope, post from any source you like to give them a sense of your style and what you’re looking for.